When the sun rose over the lush, green fields of Spirit Crossing in Northeastern Tennessee on the first day of Solasta Festival, you couldn’t see it, shrouded as it was by Appalachian mountain mist and cool cloud cover. Volunteers and staff who worked through the night were putting finishing touches on modest infrastructures and installations in the quiet dawn. Campers who arrived the night before took prized real estate along one of the grounds’ lone tree lines, or on the bank of the Clinch River that flows lazily through the grounds. As morning turned to noon the sun began to peek on the festival. For the rest of the weekend - from logistics to music to the familial atmosphere - the presence of the sun was the only inconsistency at Solasta Festival. Just over 1,000 people settled on the grounds that weekend. In its second year, the gathering quadrupled in size and exceeded the expectations of everyone besides perhaps its young and wily staff. The event was conceived with the intention to do something different. With just a single stage, a niche lineup full of rare international and coveted local acts, a dedicated lounge and performance theater, and a pervasive emphasis on health and self-care, Solasta didn’t stray from this conception. “It’s different,” I responded. And indeed it was. Spirit Crossing sits on the outskirts of the county seat, Sneedville, home to approximately 1,200 people. The hills - steep, rolling, and frequent - break apart and condense cloud formations and create that unpredictable weather. Although the forecast called for constant rain, the festival saw just one brief, powerful storm and a series of scattered showers. In the spirit of differentiation, Solasta partnered with GNOSTiK to establish the GNOSTiK Lounge and Performance Art Theatre at the center of the broad, flat festival grounds. This welcoming space hosted 22 performers doing about 15 acts on Friday and Saturday, from fire manipulation to less conventional fare like contemporary dance, poetry, kink, and burlesque. Our favorite act had to be Fire Circus for their combined acro yoga and fire-spinning act, “It’s a platform for performance artists to express fully realized visions in a cultivated environment,” according to GNOSTiK co-owners and co-creators Ali Khemi and Silv Era, who traveled west to Solasta from their base in Savannah, Georgia. The Lounge captivated by creating an atmosphere apart from the rest of the festival, while simultaneously being an integral part of it. “Gnostik is not reliant on already existing spaces provided by the music culture,” Ali and Sliv explained, “but rather creates the vessel that invites performers, musicians and artists to create within the vision.” Other attractions and concerns faded fast as one became enraptured in the theatrical and sexual nightclub mystique of the Lounge. The decor was sophisticated but with a sharp edge, and heady teas and elixirs were served out of a Lounge bar. GNOSTiK “merges the lines between performers, musicians, and spectators,” according to Ali and Silv. DJs spun music from behind the theater’s curtain (this lent itself to secret sets from Detox Unit, Grouch in Dub during the theatre's off hours), performers hung out and served at the elixir bar, and cross-legged spectators in the grass inched as close to the fire manipulators as safety would permit. It was all too easy to get couch-locked in the Lounge, sinking into a plush cushioned seat with an arousing beverage as performer after dazzling performer floated and stomped across the stage. Your correspondent was nearly couch locked thusly were it not for the call of journalistic responsibility. Instead, I found myself ambling briskly between the Lounge and the stage to absorb the best of both worlds. 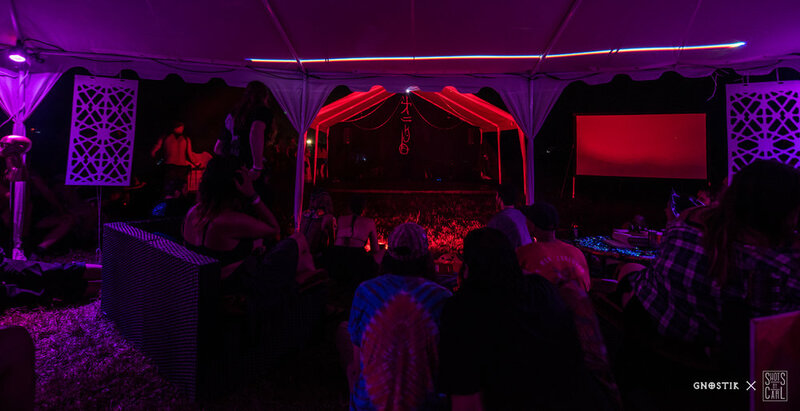 This walk between Lounge and stage involved frequent stop-ins with the Mermaid Oasis Hydration Station, a twist on the traditionally faceless festival water-fill up. Here ladies costumed as mermaids ran cold, fresh, plain or flavored with watermelon or cucumber or more. Pickles, the leader, humbly demonstrated her filtration system; the water is drawn on grounds from a well, sterilized for bacteria, and filtered for sediment. In the sporadic but consistently hot Tennessee sun, Solastafarians kept hydrated throughout the weekend. Down towards the river was the main stage - a fully encapsulated dance environment created by Sacred Element Event Design. Sacred Element’s founder Maurice Legendre is actively shifting away from manic, masculine, and overwhelming norms in stage and lighting design, and his creation at Solasta reflected this. “It offers but it does not demand,” he told me. Indeed the lighting was first and foremost atmospheric. Lights backing the stage and ringing the dance floor were subtle in their movement and usually featured no more than two colors at once. The low stage was decorated with elements from the natural environment, with wood and rock creating a tranquil pond at the foot of the platform surrounded by mammoth hunks of quartz. Approaching the stage on Friday afternoon, Cameron Ingraham aka Mickman briefly dipped his hand into the pond, looking for a second like someone dipping into a vessel of holy water before entering a house of worship. The stage was flanked by two purple Funktion One speaker towers tuned to perfection by the Soundsystem Cultures, LLC crew which came north to Solasta from Chattanooga, TN. I’d later see Cameron on top of one towers pulling a tarp over the stack during a scattered shower, one of many small instances where the lines between performers, staff and attendees at Solasta were greyed. A ring of bamboo trussing and six or seven teepee-like structures encircled the dance floor. One could literally recline luxuriously with the crew in these structures filled with blankets and pillows without leaving the stage. Two terraced jungle gym like towers added greater dimensionality to the dance floor (“more of a West Coast thing” according to one of the sound techs). These spatial designs helped cultivate the kind of communal atmosphere at a stage that is prized by every festival, but truly achieved by few. Solasta’s talent bookings offered rare artists in a rare setting, like Solar Fields from Sweden, Grouch from New Zealand, or Goopsteppa and AtYyA from British Columbia, Canada. It was the undercard, though, that provided some of the most endearing one-of-a-kind sets. There was a Saturday afternoon set from Doyle, making his first festival appearance ever after spinning for nearly a decade, most recently out of Nashville, TN. A swaggering Southeast crew swarmed the floor with unmatched enthusiasm as Doyle dropped a clean DJ set full of classic and contemporary heaters. spacegeishA brought a big time DJ set as well. She impressed folks who were unfamiliar with her seamless mixing style and unmatched track selection (informed by her position as director of the vanguard digital label Street Ritual). This packed primetime set (10:30pm) combined with the informative talk she delivered on "Living the Label Life" solidified spacegeishA aka Becca as a major presence at Solasta Festival. As international dubstep deep head Leon Switch started spinning on Saturday night, a pair of bright red and green lasers suddenly began beaming out from the landowner’s house. The house sat on the property's high ground about 400 yards up a hill opposite the stage. The lights soared across the sky high above Spirit Crossing, tying a bow on the entire experience and creating one of those rapturous moments where you can perceive all elements in an environment as one beautiful, synchronous whole. My colleague, who was strolling up grounds nearer the house, said he saw a man in his sixties with long, thinning blonde hair perched on the porch above a control board. There, swinging the lasers back and forth with ecstasy in his eyes, was Wes, the landowner, apparently having more fun than anyone else at Spirit Crossing. Additional stand out sets came from EasyJack, Mickman, Vinja, of course Jade Cicada, and Push/Pull aka Liam Collins, one of Solasta Festival’s three main organizers. 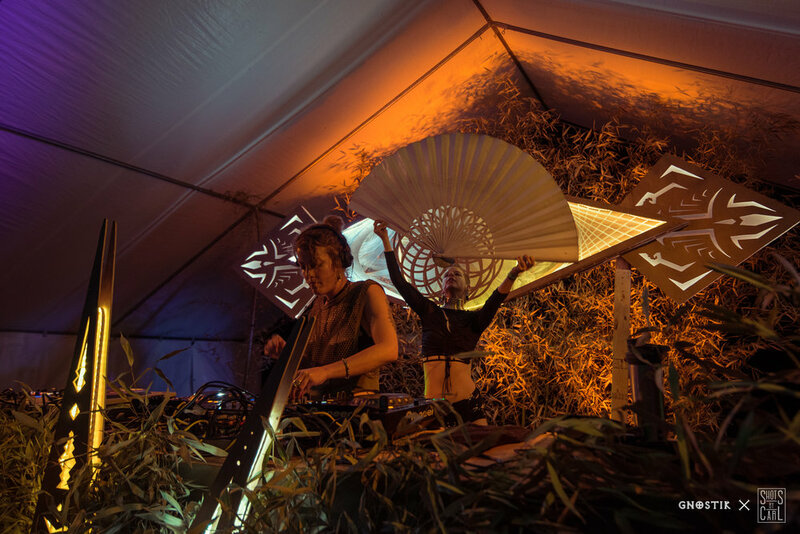 As the sun began to set on Friday, Mickman, uncharacteristically enthusiastic on stage, led his performance with provocative downtempo before launching into 40 minutes of his spellbinding sine-wave bass and hard drum breaks. Push/Pull followed with earthy midtempo, channeling some of the energies he’d picked up while staging the grounds in the past week. After shaking up the vibes with some tasteful Techno as Frisk, Jack Whelan thrilled the crowd with raw yet intricate psychedelic breaks as EasyJack on Saturday evening. Every musician on site truly brought their best juice. At a certain point it became a matter of pure stamina for the crowd. Even amidst this stellar lineup, the Clinch River was Solasta’s star attraction. Running slowly east to west along the border of Spirit Crossing it provided all sorts of relief and recreation. It was perfect for cooling down and connecting with new people or old friends outside the bustle of constant bass music. Although Solasta was billed as a one-stage event, a last-minute river party saw the festival add a modest “river stage” designed with humor by Illuminera. This little spot had a renegade vibe, as DJs and producers not part of the original billing including Deerskin and Soul Candy sent vibrations out across river for the utterly happy people cooling off in it. Solasta Festival of course couldn’t conjure magic without the diligence and attention to detail of the producing entities Envisioned Arts and Harmonia. Each company brought their own production team which, joining with Collins, formed a dream team of young and excited event producers. On Sunday, Solasta Festival’s officially unofficial decompression day, as brunch was being served down at the stage I found myself in an administrative trailer sipping a strong mimosa stirred up by Dom Lu, the site lead at Solasta and a veteran of Envisioned Arts. We spoke about his early years in event production (“Anytime someone asks you to do something, just do it”) and the often unnoticed efforts that contribute to a safe, functioning festival. “For me, I’m all about the attendees,” Dom said. “If you throw me in Artist Hospitality or something…that’s not my style. To me, everyone who’s on the dance floor, everyone who’s in the back with their friends who paid to be here, those are the artists to me. That’s who I care about.” As I felt my own forehead slowly begin to cook from a weekend in the sun, I noted that Dom had a permanent peel down along his nose. The skin under his eyes appeared raw with a pinkish hue; battle scars from many successful events, and likely a few failures. “Doing all the work, I don’t mind doing it. I’ve had those experiences where I’ve been to festivals and had the time of my life. I want to be able to recreate those experiences for other people.” Judging by the fixed smiles and strong auras of good will across the grounds all weekend, Dom and the rest of the event producers undoubtedly hit their mark at Solasta. 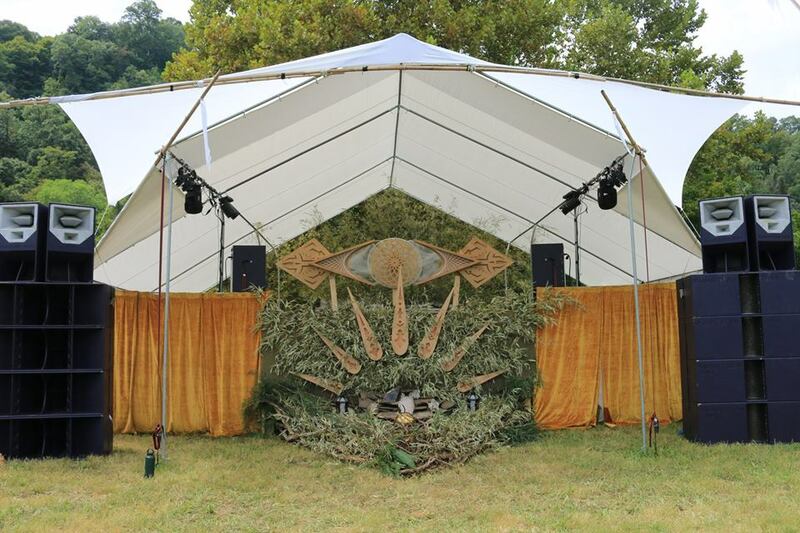 Much of what made Solasta special are those elements native to smaller festival environments. Replicating these elements on a larger scale while preserving the magic they deliver is challenging. Solasta’s growth was impressive in its second year. “A lot of festivals are still camp outs at their second or third or fourth year”, Dom noted with a bit of wonder in his voice. As this festival’s reputation grows, its organizers may have to balance a welcome increase in popularity and size with their ability to curate the intimacy that may earn the event its reputation in the first place. The great takeaway from this kind of epic Appalachian sojourn gets back to one of those old lessons or cliches of transformational music festivals; take the knowledge and experiences gained on the grounds back out into the world with you. Whatever you learned about or reflected upon at this event; music production, friendship, stage design, romance, event production, sustainability, hummus-oriented brand partnerships - bring those reflections forward with you. Woven into the rest of the world, the atmosphere and attitude of the festival becomes less of an anomaly or some brief escape from life, but a greater part of culture and life itself.